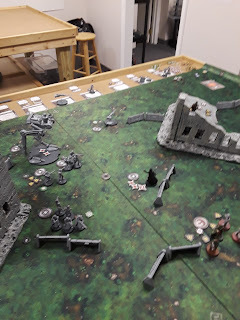 This time I was playing my old Armada buddy Chris again. 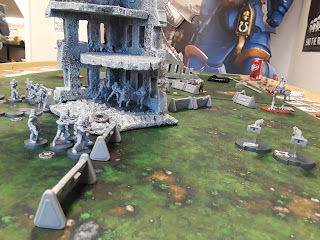 You may remember what happened when I played him last time. This time would be different! 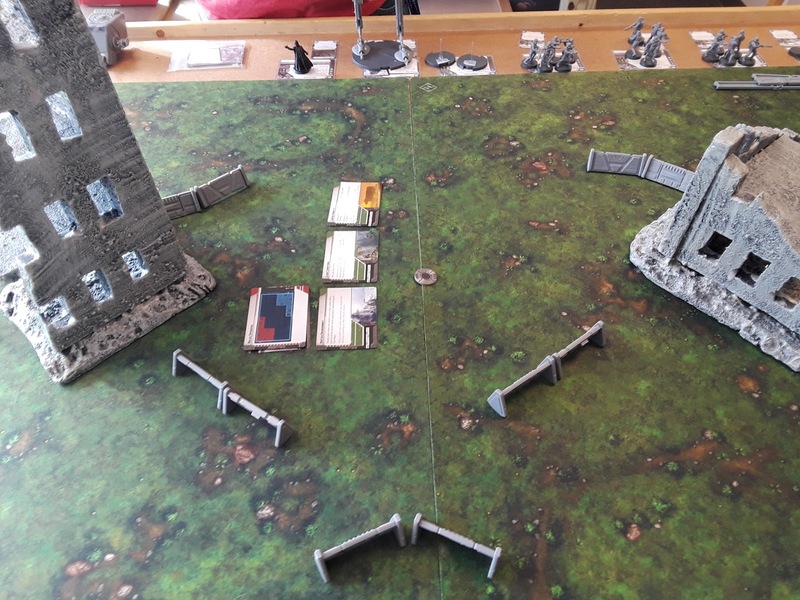 I'd just played Jake, so two games in one day! 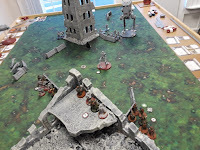 We'd be playing with some complicated terrain, with additional height, for this game. 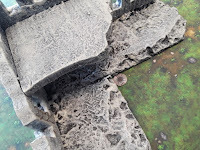 We had some ruined building terrain that would give heavy cover to any infantry inside shooting out of the windows. Both were set with the windows facing the middle. Card selection was as follows: Chris was Blue, and immediately eliminated "Key Positions". 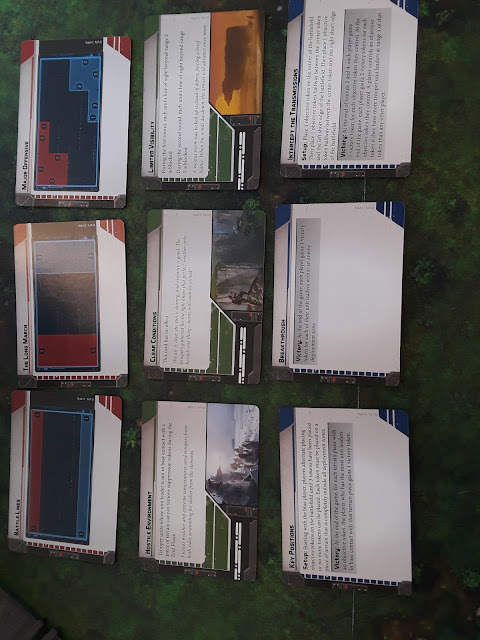 I got rid of "Battle Lines", as I didn't think it would make for a fun game, and I kinda wanted to protect "Hostile Environment". I then joked how funny it would be if we played "Major Offensive", "Clear Conditions" and "Breakthrough" again. Chris immediately eliminated "Breakthrough". 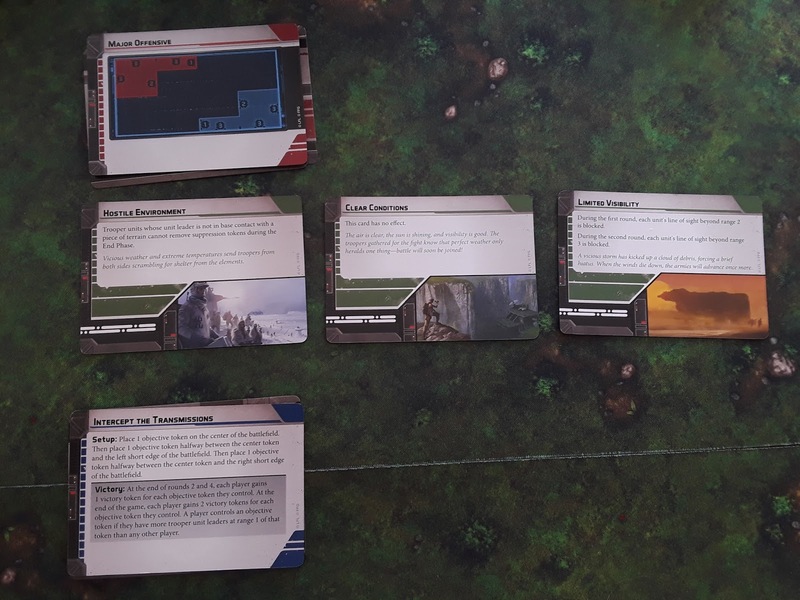 That left me to either pick playing Clear Conditions and The Long March with Intercept the Transmission, or take Hostile Environment and Major Offensive. 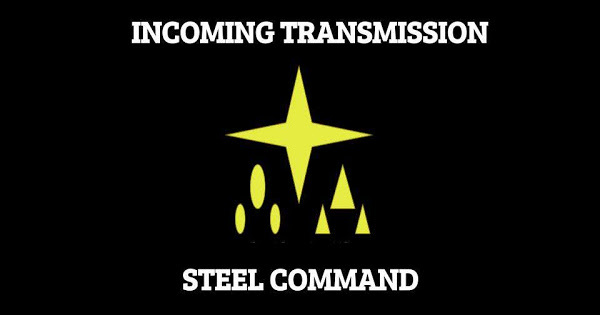 Either one of the deployments paired poorly with Intercept the Transmission, so I decided to make things more interesting by taking Hostile Environment. We set the Intercept the Transmission objective points out, and found two were heavily fortified. 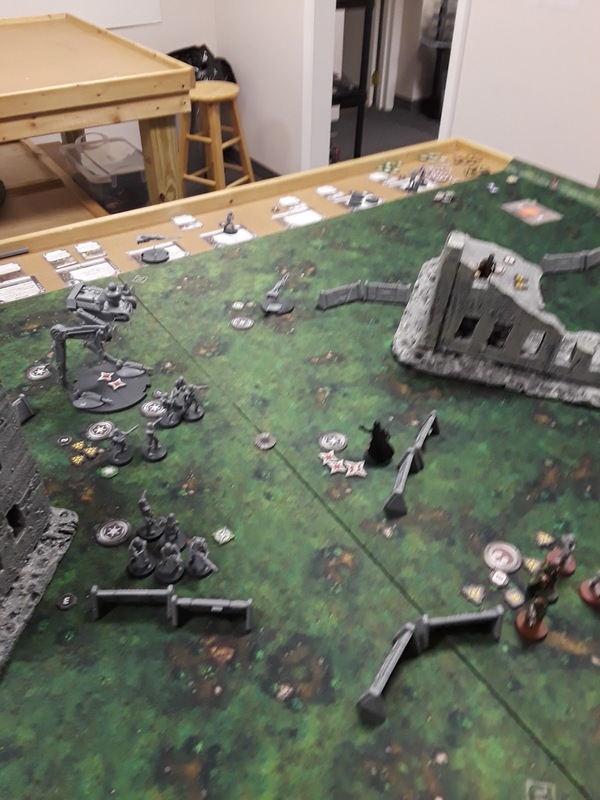 We'd be playing for the middle of the board. 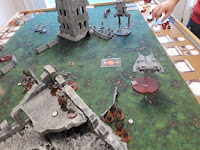 Chris set his forces up with his troopers and Vader ready to play for the middle of the board. His speeders would come around the far flank. Because of where the terrain was, he would be able to get his forces into position quickly to cover anyone crazy enough to walk into the middle of the board. Meanwhile, I set my forces in position to push up to the barricades in the middle of the map. 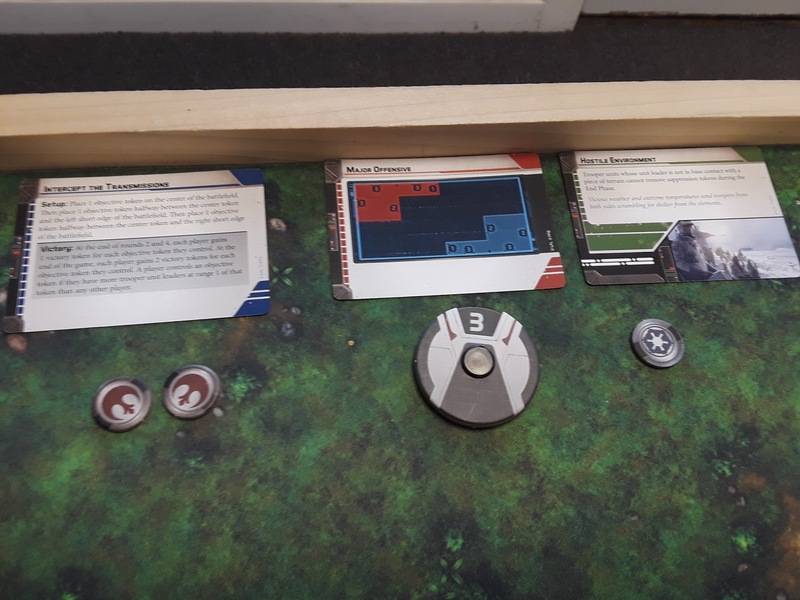 My thought was to feed troopers into the middle on Round 2 and Round 4, collecting victory tokens, and then do a final push with my remaining troopers / Luke on Round 6, for the double tokens (or at least to deny Chris). My Airspeeder set off far right to deal with the AT-ST, my Flamethrower AT-RT would push the middle with my troopers, and the AT-RT with the rotary blaster would try to deal with the speeder bikes. 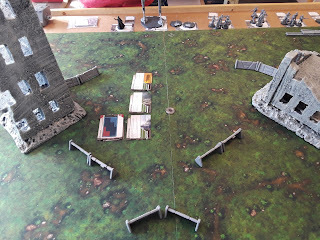 Round 1 started with both of us playing our Standing Orders. 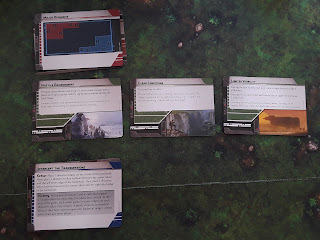 I had a slight advantage on activations, and would go last, selecting my Speeder. 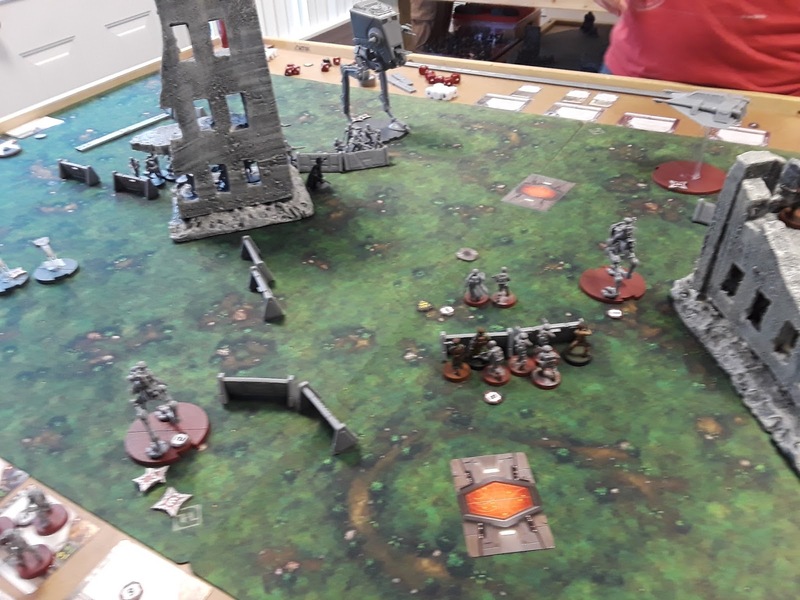 Round 1 had us moving our troopers into position, but his selection of DLT-19 as his heavy weapons squad proved valuable, as he was able to fire at my Unpainted Squad, hitting them hard with multiple attacks and knocking out 3 troopers. Also I found that his Speeder Bikes were in a dangerous position vs my AT-RT. 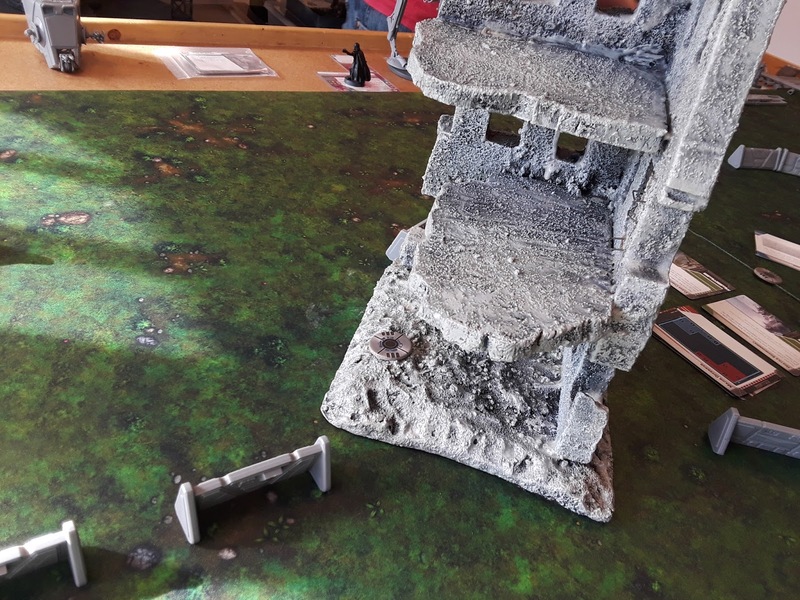 I had one of my trooper units clamber up to the second story of one of the ruins in the hope of trying out the clamber rules. 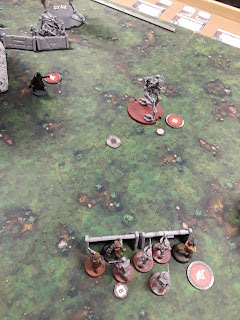 One mini failed and died. 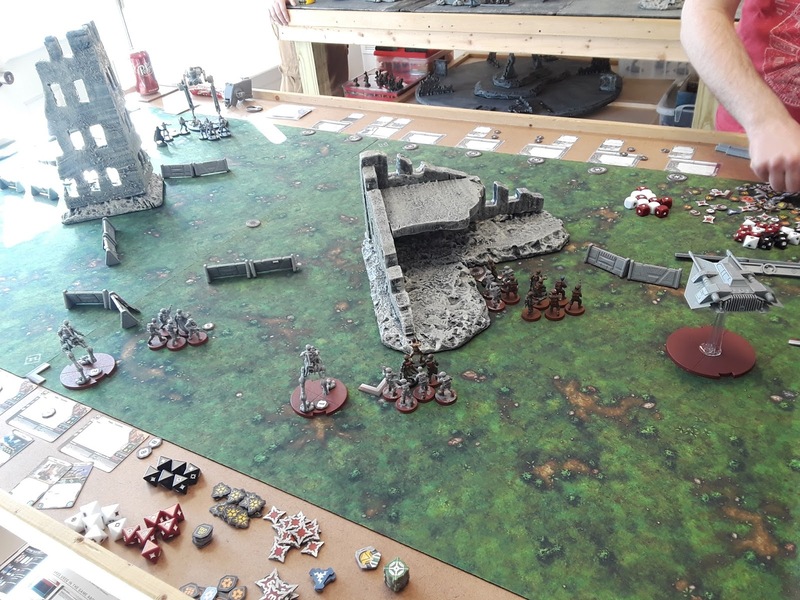 Still, we had formed our defensive formations, and I would be hopefully able to press on to claim tokens on Round 2. Round 2 began with his Ambush and my "My Ally is the Force" as I figured I would be better off getting the Airspeeder Ambush off next turn, and protecting my Troopers in the open was important. 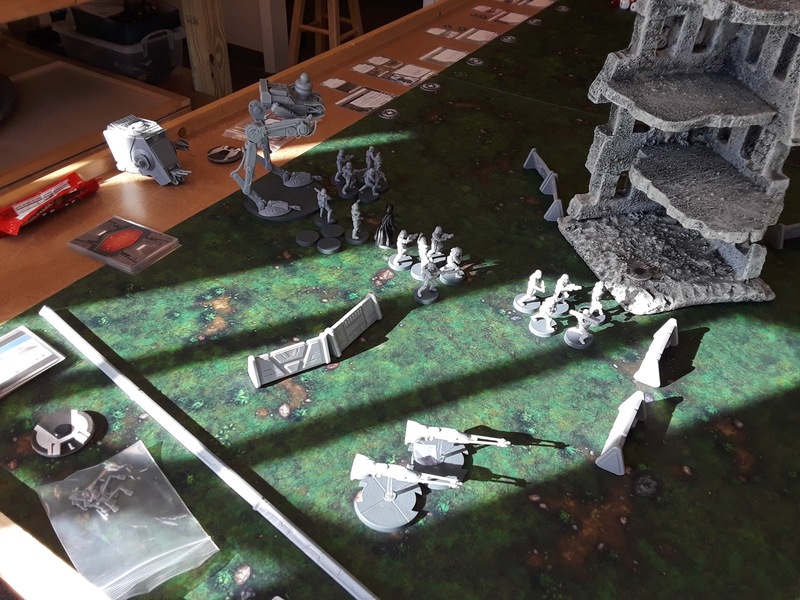 He decided to Ambush, and assigned his Ambush order to one of his Troopers that could fire on my damaged trooper squad. 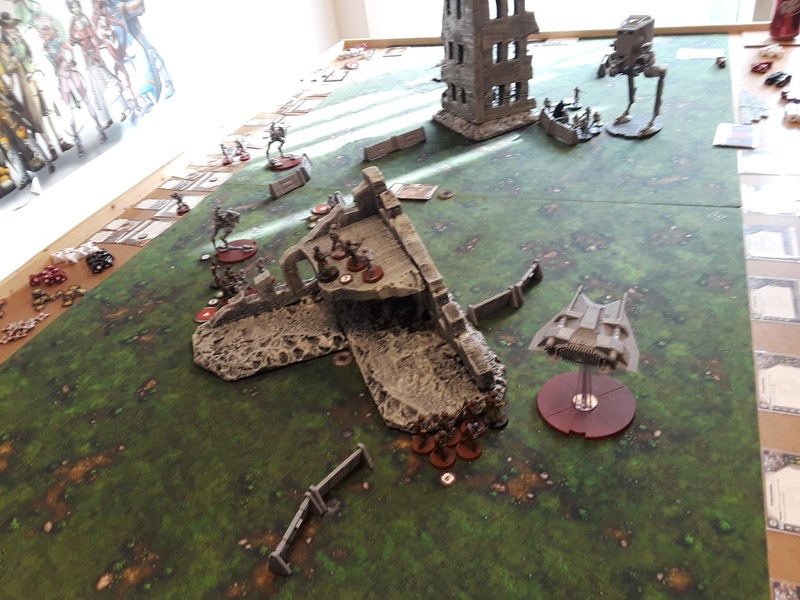 He moved his Speeders up, crippling my AT-RT, while I moved my Airspeeder up to get some shots off on his AT-ST. More fire resulted in my Troopers receiving suppression, but not much else in the way of damage. 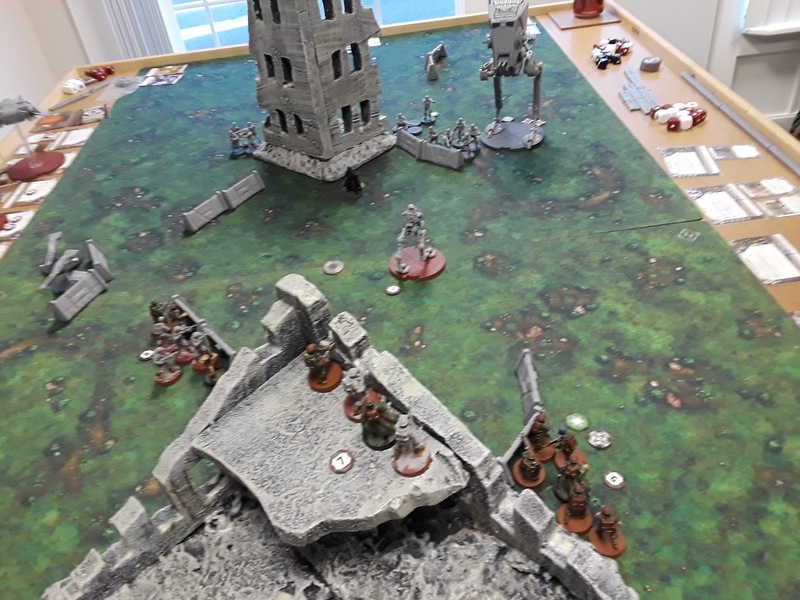 His own troopers had definitely found their defensive positions, and were able to take long range shots into my positions with their heavy weapons, while my own Troopers with their Range 3 weapons were unable to respond. 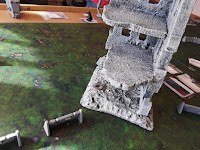 I did push my unpainted squad forward to contest the middle objective and claimed it unopposed. Round 3 started with me in the lead, but it was a tentative lead. 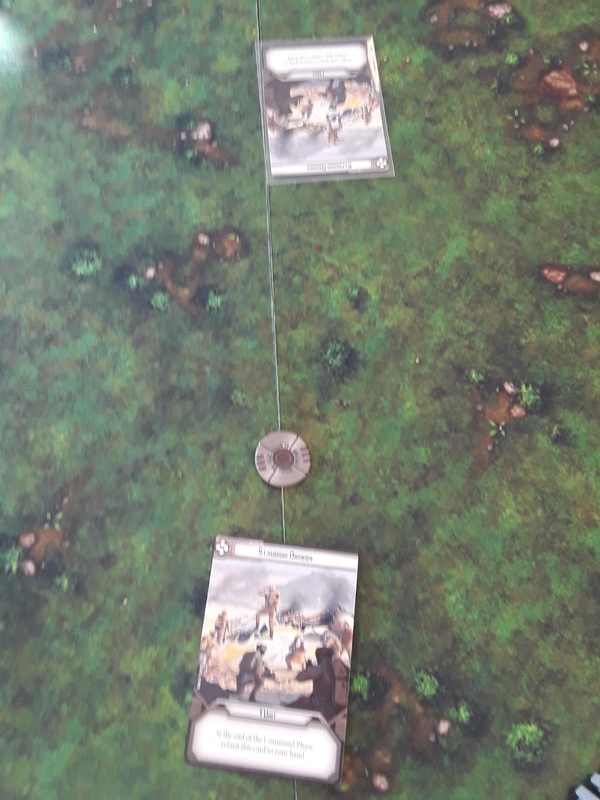 There was no telling how long I would be able to hold when he had range on my units, and I couldn't contest without moving my units out of cover. 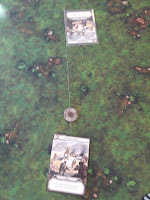 His own forces were in good cover though, and were able to shoot my troops. 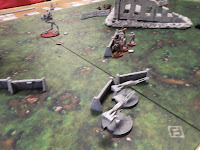 In addition, the speeder bikes had already disabled my AT-RT's main gun, leaving him with his backup blaster and claws. I had nothing nearby to support him either. He was just going to be a speed bump. 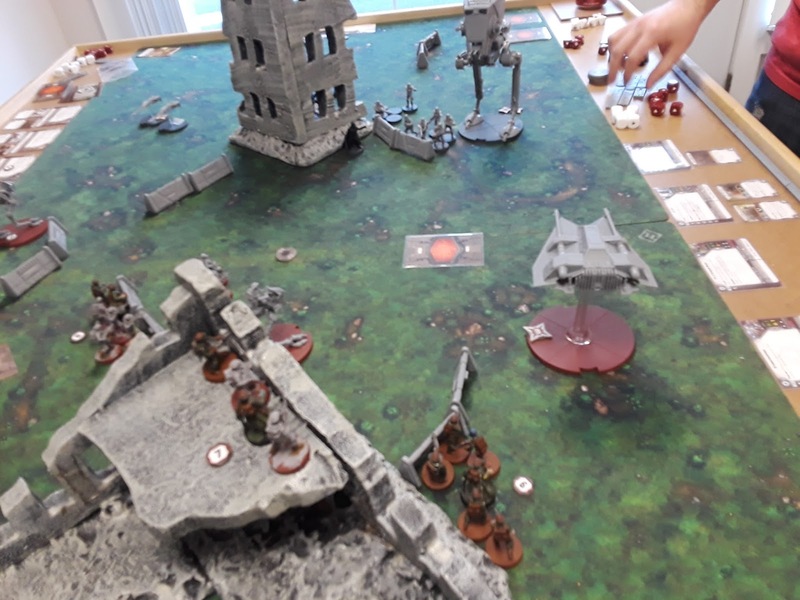 Meanwhile my Flamer AT-RT was pushing up towards his line, hopefully able to either do something about the troopers in cover, or to distract the AT-ST into shooting it instead of my other forces. My Airspeeder was getting into range of his far flank, anchored as it was by Vader and the AT-ST. 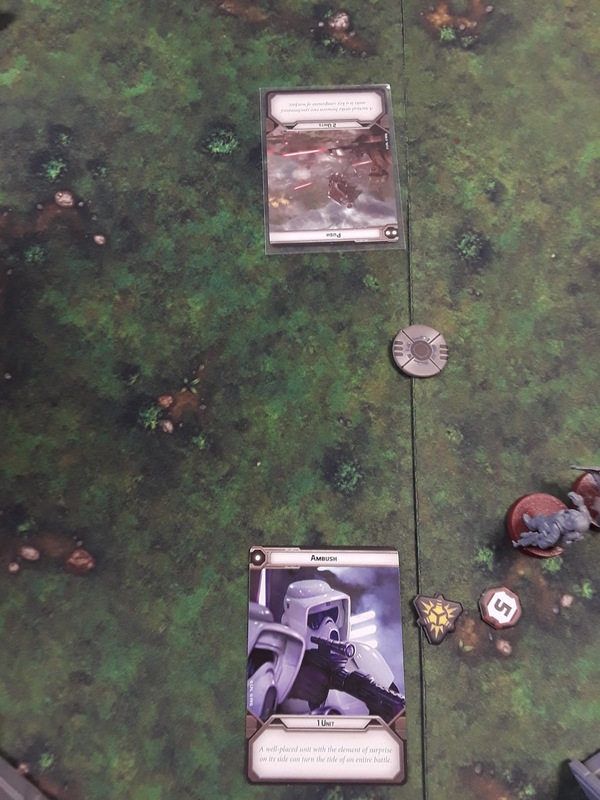 I also had a unit up in good cover overlooking the middle objective, and a fully health trooper squad coming up behind the Airspeeder. 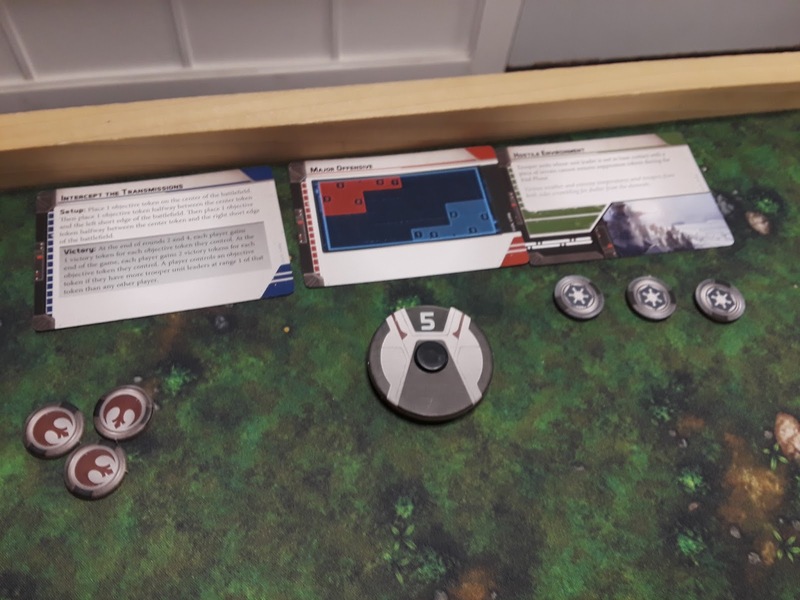 So for Round 3 I selected "Ambush" while he picked "Push". 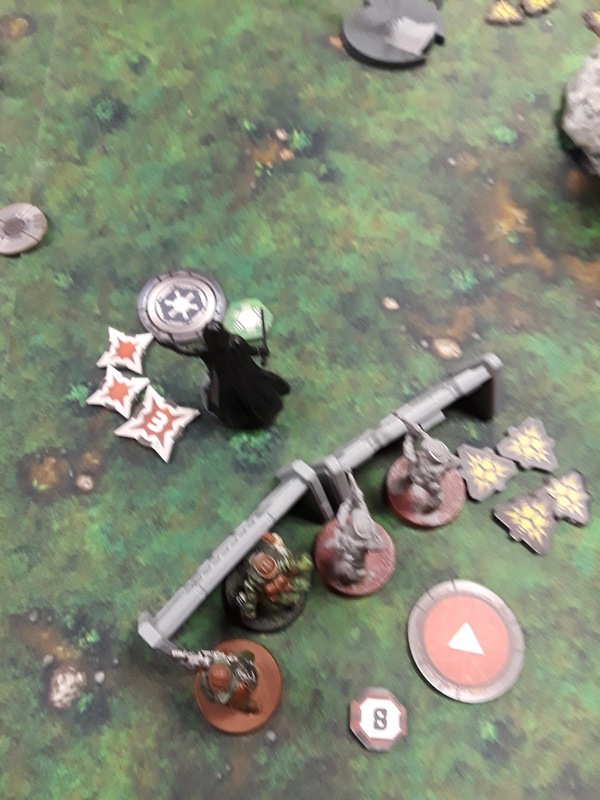 I decided to go with my Airspeeder, who was in a bad position if it couldn't do something about that AT-RT. Things... did not go well. I don't have a picture of it, but upon realizing I would not be able to get the Airspeeder out of the AT-RT front arc with 2 moves, I decided to spin and harpoon it, to hopefully spin it away from the fight. I... failed. 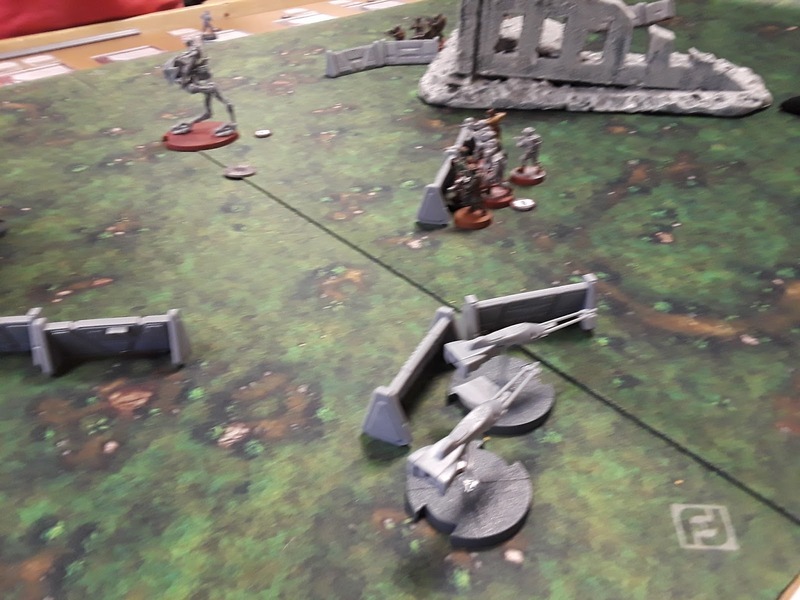 The harpoon missed and the AT-RT and Stormtroopers splatted my Airspeeder. 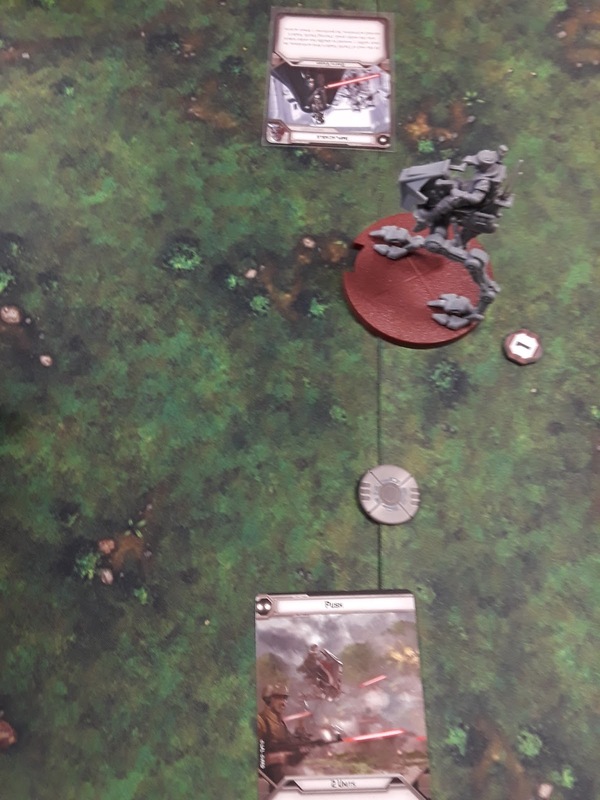 The Speederbikes and Vader moved forward, and I last-activated my AT-RT flamer to move him into a good position to hit the Stormtroopers behind cover next turn. Round 4 began with me selecting "Push" and Chris selecting "Implacable". 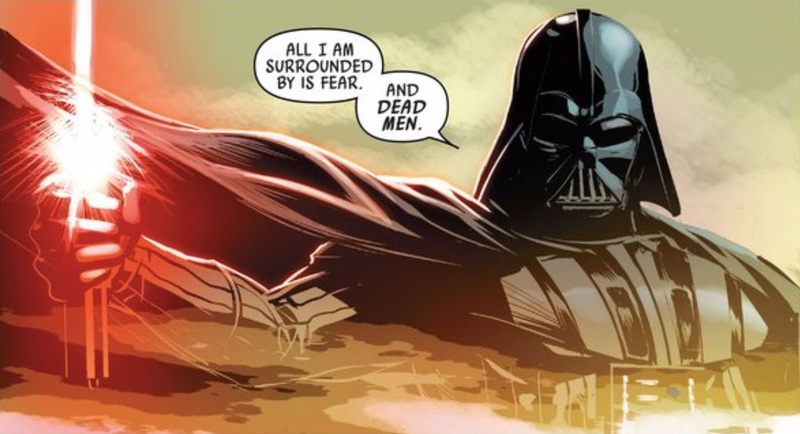 This was going to be Vader's time to shine. 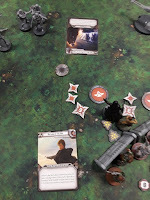 In a genious move, Chris actually delayed Vader's activation until the end of his turn, getting off Vader's first activation and then a second to get him into melee range of Luke who had to hop the barricade to contest the objective. Then it was all Vader, as he jumped in to wreck Luke. He also moved a second trooper unit up to gain control of the objective token. 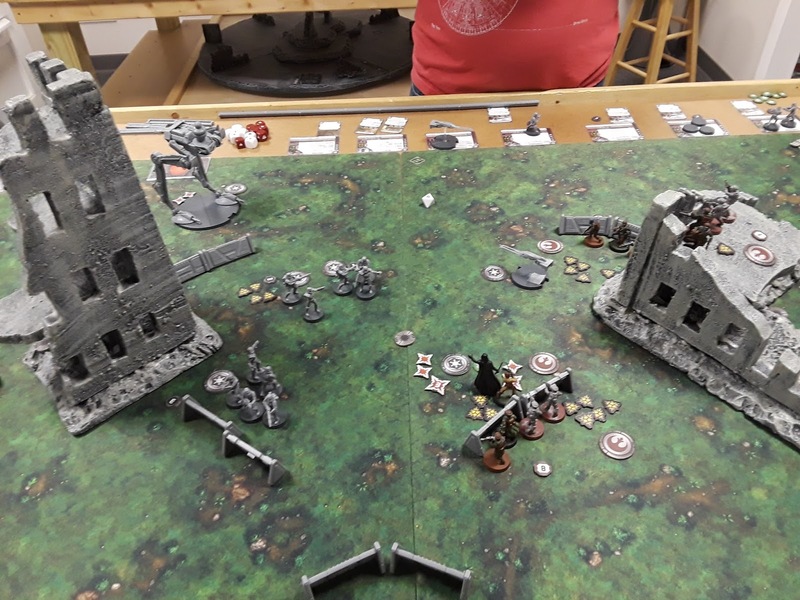 Things were not looking well, and it would all come down to Round 6 and if I could hold on. 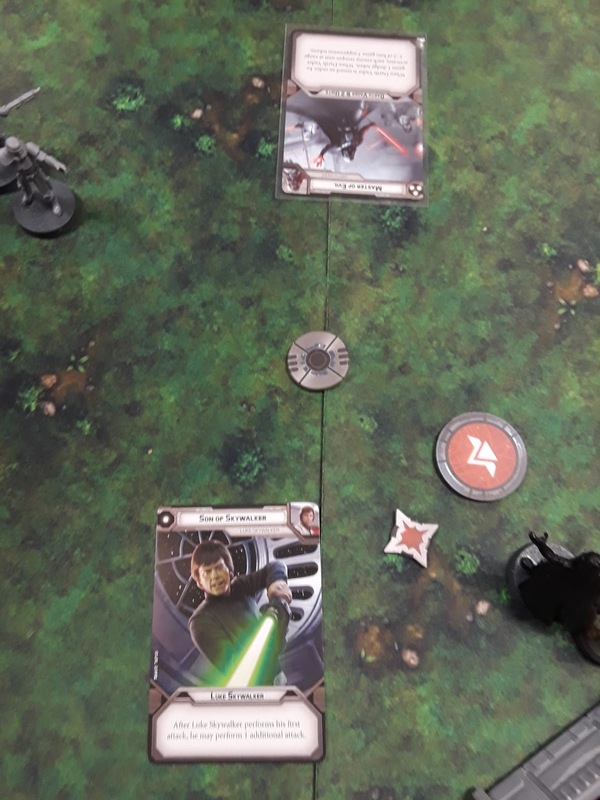 Luke would activate first and pour damage into Vader, knocking him down to 1 health. Things were not going well. 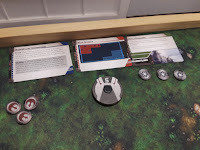 I had to get more suppression tokens than I had in the core box to cover the amount of suppression Vader and his friends caused that round. But Luke was still alive and he was keeping people from breaking! Well, maybe not. If you were paying attention, you'd know I only had 3 pip cards left in my hand. Chris still had a 2 pip card left, and played it now giving Vader the first activation. Luke was at 2 health, and a simple coup d'grace would do the trick. Luke didn't roll lucky enough. Vader was triumphant. Seeing their leader fall was more than the Rebel Troopers could reasonably take. They immediately broke. From that point on, it was a Victory Lap for Chris, who attempted to run the Rebels down to the last man. Though it certainly didn't feel anywhere near as close. - Speederbikes will rock a lone AT-RT. 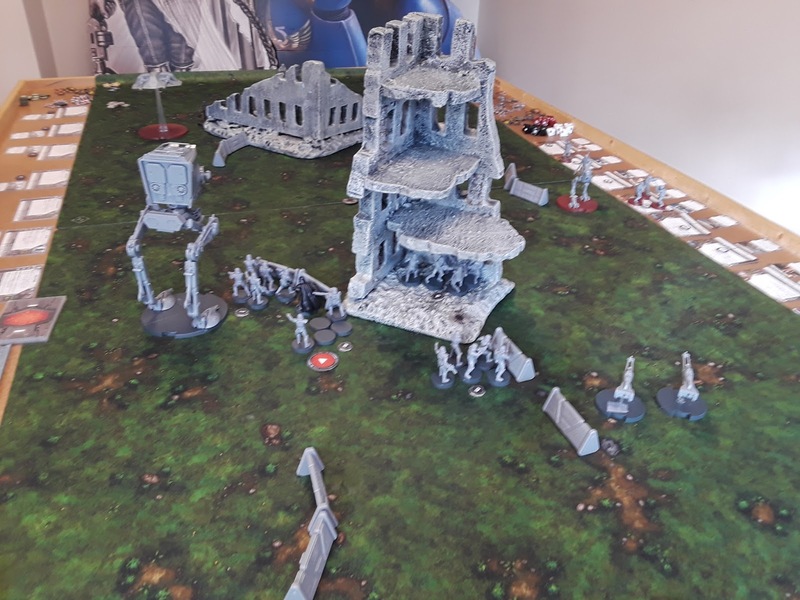 Never leave an AT-RT without support of some kind. - Being outraged is very dangerous when your opponent has no good incentive to push into your position. I would have been much better served leaving the Battle Lines deployment, and forcing a scramble, or pushing up my left flank instead of wasting time with my right. - Airspeeders shouldn't rely on the harpoon as their first line of defense. Good god that was bad. - Sometimes you need to sacrifice a trooper unit to seize an objective. This is fine. 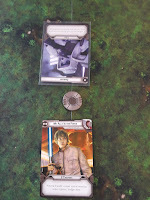 - Once again, the Vader / Luke duel came down to who got the first hit in. In this case it was Vader, and Luke (and his buddies) were wrecked because of it. I am surprised to see someone forgo the lightsabre throw upgrade on Vader - it seems perfect on a model that gets a free attack after moving.